There is nothing quite as magical as a festive home feeling. If you are someone who looks for any opportunity to put up the Christmas tree as early as possible, you will love the advice we have got for you in this post. Read on for seven great tips on how to make your home festive during the winter months. One of the easiest ways to add Christmas flair to your home is to invest in some festive table decorations. You can even get creative and make your own. One DIY option that looks incredibly stylish is to gather several wine glasses, place a mixture of baubles inside of them, and then place them on the table upside down with a tea light candle on the top. Feathers are fluffy and pure; just like the first snow of winter. If you are looking for a creative and contemporary way to make your home festive, why not consider feather ornaments or owls? You could fill clear glass balls with an array of different feathers for a unique display that you can switch up depending on the colours in your home. Artificial lighting can be incredibly harsh. Instead, create the perfect atmosphere with candlelight. If you have a fireplace, now is the time to make full use of it. The possibilities are endless with holiday greenery. 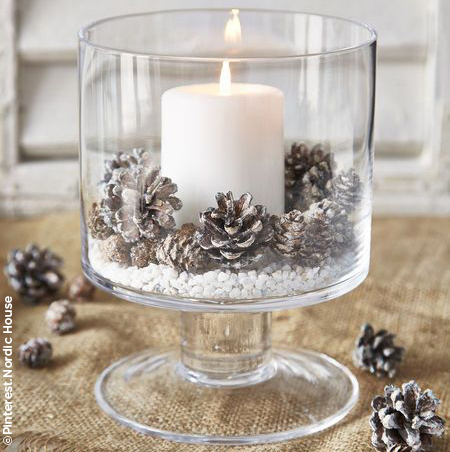 You can decorate candles with evergreen sprigs and ribbons. Or, why not add a small poinsettia to the kitchen or bathroom? Another easy option, which will create a cosy and homely vibe, is to add pinecones to a clear vase and use as an ornament. You can easily combine the pinecones with other forms of decoration to create something uniquely yours. You don’t need us to tell you that a wreath is Christmassy, but why not go for something different than the standard pinecones and greenery? Paper wreaths offer limitless possibilities, and a quick search online will alert you to everything from DIY cork wreaths to wreaths made from geometric shapes. One of the best ways to give your home a Christmassy feel is to place scented candles around the home. All you need to do is a quick search online and you will find candles with an array of different festive smells, from spicy, cinnamon, to gingerbread, to those with a clean, frosty morning smell. Do you have some spare glass vases around your home? Instead of filling them with flowers, go for a fun and contemporary vibe by filling them with tasty festive treats, such as gingerbread men and candy canes. Your guest will love them! These are just a few examples of how you can make your home look warm and welcoming this festive season. Use your imagination and bring your home to life by incorporating your favourite festive items into the mix.